Insider Monkey has processed numerous 13F filings of hedge funds and famous investors to create an extensive database of hedge fund holdings. The 13F filings show the hedge funds and investors’ positions as of the end of the third quarter. You can find write-ups about an individual hedge fund’s trades on numerous financial news websites. However, in this article we will take a look at their collective moves and analyze what the smart money thinks of Hilton Grand Vacations Inc. (NYSE:HGV) based on that data. There was a massive fall in hedge fund ownership of Hilton Grand Vacations Inc. (NYSE:HGV) in Q2, as 38% of the former hedge fund shareholders of the stock sold it off during the quarter. The bleeding stopped in Q3, as there was a slight rebound, with several hedge funds adding HGV to their portfolios. Jay Petschek and Steven Major’s Corsair Capital Management actually opened a position in Q2 when everyone else was selling, and predicted 50% upside over the next 12-18 months in its Q2 investor letter, which would be 79% upside now. “HGV, a recent spinoff from Hilton Worldwide (“HLT”), is an international timeshare developer/operator, priming itself for meaningful growth over the next 12-24 months. Yet, despite having increased Fiscal Year (FY) 2018 guidance on the back of stronger than expected Q1 sales, the market has penalized HGV for a confluence of non-fundamental factors that we believe will abate in the coming quarters. In our view, HGV’s revised capital investment plan, with its 15-20% after-tax IRRs, reflects strong pent-up demand for its premium product and uniquely positions HGV for above industry organic growth. The future has never looked brighter for HGV yet it trades at its lowest forward multiple post spin. Using a ‘Sum of Parts’ analysis to properly value HGV’s different fee streams, we assign a blended 10.5x multiple on our 2020 EBITDA estimate which yields a $55 per share stock price or >50% upside over the next 12-18 months,” the fund wrote. In the eyes of most market participants, hedge funds are perceived as slow, outdated investment tools of the past. While there are greater than 8,000 funds trading at the moment, our researchers hone in on the masters of this club, approximately 700 funds. Most estimates calculate that this group of people oversee the lion’s share of the hedge fund industry’s total asset base, and by keeping an eye on their top picks, Insider Monkey has deciphered many investment strategies that have historically beaten the market. Insider Monkey’s flagship hedge fund strategy outpaced the S&P 500 index by 6 percentage points annually since its inception in May 2014 through early November 2018. We were able to generate large returns even by identifying short candidates. Our portfolio of short stocks lost 26.1% since February 2017 even though the market was up nearly 19% during the same period. We just shared a list of 11 short targets in our latest quarterly update. What have hedge funds been doing with Hilton Grand Vacations Inc. (NYSE:HGV)? At Q3’s end, a total of 27 of the hedge funds tracked by Insider Monkey were long this stock, a 17% rise from one quarter earlier. 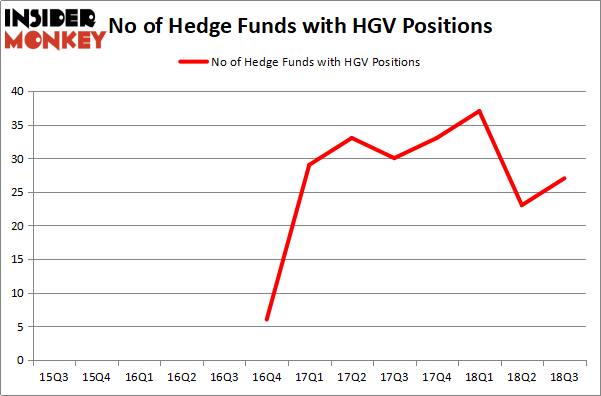 The graph below displays the number of hedge funds with bullish position in HGV over the last 7 quarters. So, let’s examine which hedge funds were among the top holders of the stock and which hedge funds were making big moves. The largest stake in Hilton Grand Vacations Inc. (NYSE:HGV) was held by Gates Capital Management, which reported holding $86 million worth of stock at the end of September. It was followed by Long Pond Capital with an $81.3 million position. Other investors bullish on the company included AQR Capital Management, D E Shaw, and Marshall Wace LLP. With general bullishness amongst the heavyweights, specific money managers were breaking ground themselves. Gates Capital Management, managed by Jeffrey Gates, initiated the most valuable position in Hilton Grand Vacations Inc. (NYSE:HGV). John Khoury’s Long Pond Capital also initiated a large position during the quarter. The other funds with new positions in the stock are Michael Doheny’s Freshford Capital Management, Tsachy Mishal’s TAM Capital Management, and Malcolm Fairbairn’s Ascend Capital. Let’s also examine hedge fund activity in other stocks – not necessarily in the same industry as Hilton Grand Vacations Inc. (NYSE:HGV) but similarly valued. These stocks are Smartsheet Inc. (NYSE:SMAR), Spirit Airlines Incorporated (NASDAQ:SAVE), CommVault Systems, Inc. (NASDAQ:CVLT), and American Equity Investment Life Holding (NYSE:AEL). This group of stocks’ market caps resemble HGV’s market cap. As you can see these stocks had an average of 17 hedge funds with bullish positions and the average amount invested in these stocks was $263 million. That figure was $587 million in HGV’s case. CommVault Systems, Inc. (NASDAQ:CVLT) is the most popular stock in this table. On the other hand Smartsheet Inc. (NYSE:SMAR) is the least popular one with only 11 bullish hedge fund positions. Compared to these stocks Hilton Grand Vacations Inc. (NYSE:HGV) is more popular among hedge funds. Considering that hedge funds are fond of this stock in relation to its market cap peers, it may be a good idea to analyze it in detail and potentially include it in your portfolio. 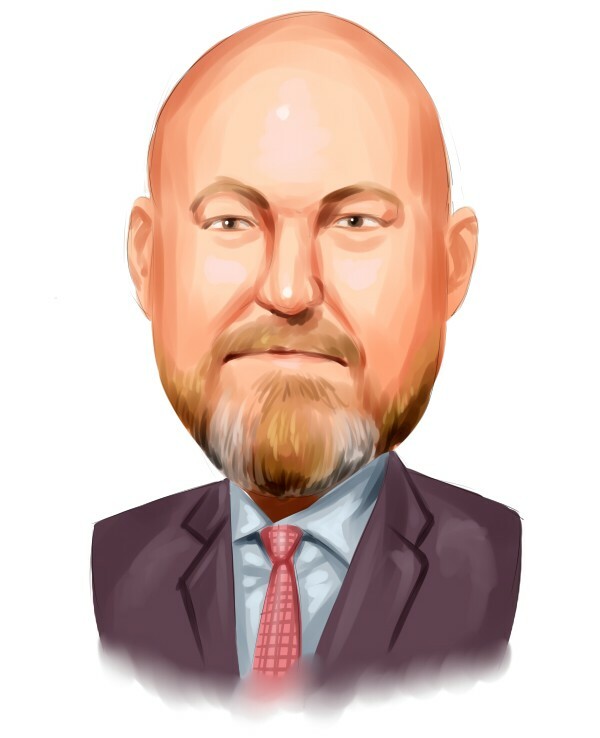 Hedge Funds Can’t Stop Buying salesforce.com, inc. (CRM) Electronic Arts Inc. (EA) Holds Off Activision Blizzard, Inc. (ATVI) to Remain... Collegium Pharmaceutical, Inc. (NASDAQ:COLL): Are Hedge Funds Right About This... Wells Fargo & Co (WFC) vs. JPMorgan Chase & Co (JPM): Hedge Funds... Hedge Funds Are Crazy About Biogen Inc. (NASDAQ:BIIB) Is OptiNose, Inc. (NASDAQ:OPTN) A Good Stock To Buy?